Analysis: Griffin served as Tampa's third quarterback for the vast majority of the 2018 campaign, eventually bumping ahead of Ryan Fitzpatrick for the No. 2 spot over the final two weeks. Given that Griffin hasn't attempted a pass in a regular-season game, Gabbert certainly will push him for the backup job. Analysis: Griffin served as Tampa's third quarterback for the vast majority of the 2018 campaign, eventually bumping ahead of Ryan Fitzpatrick for the No. 2 spot over the final two weeks. Given that Griffin has never attempted a pass in a regular-season game, the Buccaneers likely will bring in competition for the backup job before training camp. Fitzpatrick is an unrestricted free agent and likely will sign elsewhere. 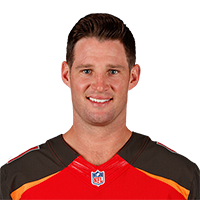 Analysis: The 29-year-old will thus have another opportunity to garner his first taste of NFL game action, something coach Dirk Koetter specifically noted was on the team's radar during his Monday press conference following the Week 16 loss to the Cowboys. Sunday's game against the Falcons is essentially for draft positioning and pride for the division rivals, so Griffin could well see the field at some point in the second half. Analysis: Griffin has been behind Ryan Fitzpatrick and Jameis Winston on the depth chart all season, but he's operating as the No. 2 passer Sunday. With the Buccaneers out of playoff contention, Griffin could see the field for the first regular-season action of his career as the team looks to see what they have in the young quarterback. There are no videos available for Ryan Griffin. Click here to view all videos.